The cards on this CD date from 1939 to the 1957. You'll find lots of Santas, Snowmen and Kids. There's all kinds of animals including reindeer, puppies, kittens and rabbits. 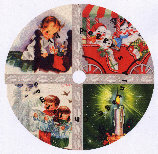 This CD is totally devoted to Christmas and contains the scans from 127 cards. This CD has 208 images with a total of 336 files (images and verses) to clone, print and/or copy and paste. The CD is almost full with 671 out of 700 meg of goodies.